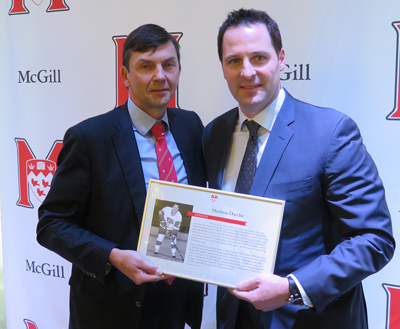 MONTRÉAL, OCTOBER 23, 2015 – Delmar International Inc. wishes to congratulate Mathieu Darche and his brother Jean Philippe (JP) on being inducted on October 22 into the McGill University Sports Hall of Fame. Mathieu has been with Delmar, the largest privately held freight forwarder in Canada, or two years now. Soon after retiring from the National Hockey League after a 13 year professional career, he was hired as Director of Business Development and Public Relations. A year later he took over the direction of the company’s Quebec sales force. Mathieu was a star for the McGill Redmen before embarking upon his pro hockey career. He played for five NHL teams: Columbus, Nashville, San Jose, Tampa Bay and finally his hometown Montreal Canadiens. He earned a degree in marketing and international business at McGill. JP enjoyed a successful professional football career, following five years at McGill. He played for the Toronto Argonauts of the CFL and the Seattle Seahawks and the Kansas City Chiefs of the NFL. In his acceptance speech Mathieu recognized how valuable his university degree was to fall back on when he decided to become a professional hockey career after graduating from McGill. “If I did not have that degree, I do not know if I’d have this job at Delmar,” he told the audience at the Ritz-Carlton Hotel. Established in 1965 in Montreal, Quebec, Canada, Delmar International Inc. has evolved into a global player and industry leader, offering Customs Brokerage, freight forwarding and supply chain logistics solutions to thousands of clients worldwide. The Delmar Group operates globally, employs just over one thousand people in 40 cities and has facilities at almost every major gateway in North America. Diversification of service offerings and vigorous expansion including many acquisitions, has led to significant growth for the Delmar Group in recent years, specifically in Asia and Latin America. Its world headquarters remain in Canada in Lachine, Quebec.